Should you host your website with this cloud computing giant? This is a powerful competitor to Amazon Web Services, but it’s for experienced users only. Alibaba Cloud is a Chinese cloud computing giant which offers an array of high performance business-oriented cloud services: data storage, relational databases, big data processing, content delivery networks and more. The range offers many of the same products as Amazon Web Services (there's a comparison here). But amongst all the enterprise-only services, the company does provide some more accessible products, including domain registration and various forms of website hosting. The regular hosting plan seems a little limited, with only 5GB disk space, a single 1GB MySQL 5.6 database and 1,000 concurrent connections (the website suggests it's suitable for up to 30,000 visits a month.) Bandwidth is theoretically limited to 50GB. Right now, that's not being applied as extra traffic is free of charge, but this could change at any time. The plan doesn't include cPanel or any simple one-click installer, either. Initially you'll have to make do with Alibaba Cloud's own custom management console. Dig into the details, though, and you'll notice some plus points. Container technology ensures websites are isolated from each other and a problem in one site can't bring the server down. Servers are configured to ensure you'll get 512MB RAM, too, something you won't generally benefit from with regular shared hosting. Despite Alibaba Cloud's global network, you only have a choice of two data centers: US or Hong Kong. Still, as this is a company which owns and manages its own servers, and uses them for some very big-name corporations, you can be sure of top performance, and that any problems will be fixed at the maximum possible speed. Pricing is refreshingly simple at $5.90 (£4.54) a month plus tax, whether you sign up for 1, 6 or 12 months. An alternative option is the Simple Application Server. This makes it quick and easy to set up a server with your choice of operating system and app images – CentOS, Ubuntu, Debian, Windows Server 2008/2018, WordPress, Joomla, OpenCart and more – and there are data centers in the US, Australia and Germany. Prices vary depending on the resources you need, but they start at a very reasonable $4.50 (£3.46) a month for a single core, 512MB RAM, 20GB storage and 1TB of data transfer. Creating an Alibaba Cloud account requires entering a lot of personal information: your name, email address, physical address, billing information (credit card or PayPal) and your mobile number (the service texts you a code to verify that it's yours). Choose a password and you're redirected to the Alibaba Cloud console. The interface is designed to give professional users easy access to all Alibaba Cloud's many services, and that makes for an intimidating look, at least initially. Browsing the tiny left-hand toolbar points you to features such as Elastic Compute Services, Server Load Balancer, ApsaraDB for RDS and various other expert-only features. Life begins to make a little more sense when you locate the Domains & Websites menu. Choose the Web Hosting plan and you're able to purchase your first month of hosting. The website warns that it may take up to five minutes to set up, but ours was configured and ready to go in around a minute. The Web Hosting console is relatively simple, at least by Alibaba Cloud standards. A Host List table includes the plan you've just purchased – this displays useful details about your hosting, including a temporary URL in the form wh-2ww1bgcfk.aliwebs.com, and you can browse your web hosting management panel with a click. Alibaba Cloud's web hosting console doesn't have any of the usual consumer-friendly technologies to help you create your site. There's no website builder, for instance. No equivalent to cPanel's File Manager, and no Softaculous-type one-click installer for easy setup of WordPress, Magento, or whatever else you might want to use. Instead, all you can do is upload files via FTP, and if they're archives, expand them to the folder of your choice. This isn't quite as bad as it sounds. You can still install WordPress or just about anything else, you just need to do a little more work. To set up a copy of WordPress, for instance, you must download the latest package, upload and extract it to your web space and run the installation script. The official How To support page explains further. The system creates a single MySQL database for you, displaying its name and user name in the console. The documentation says the console has a built-in graphical database management system for defining and creating tables. We couldn't find this, but as the documentation says it only has a Chinese interface right now, that might not have made much difference (other languages are "in development", apparently). Fortunately, there are workarounds. One option is to install a local MySQL client to enable accessing the database from your own system, or you could install a standard tool such as phpMyAdmin in your webspace. As with WordPress, this isn't exactly convenient, but it's not difficult, either, and the official documentation walks you through the necessary steps. Signing up for Alibaba Cloud's Simple Application Server could make your life a little easier, as it can be purchased with ready-to-go images of WordPress, Drupal, Joomla and more. There's still some work to do in using a remote connection to obtain administrator passwords or other details, but again, that's not difficult, and detailed documentation covers everything you need to know. Getting started with Alibaba Cloud may take a while, but there's better news when you're up and running. Running Bitcatcha and other speed tests on our products showed excellent performance, particularly for US users close to the Silicon Valley data center. That may not be much use if your visitors are in Europe, and your Alibaba Cloud plan doesn't offer a European data center. Having just US and Hong Kong locations for basic web hosting, for instance, really doesn't allow you to take full advantage of the company network, and hopefully the company will be giving customers more choice very soon. 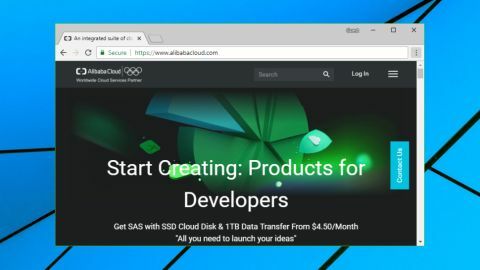 What you can do is extend your website by paying to add more Alibaba Cloud technologies, for example locking out hackers with a Web Application Firewall, or improving performance further with its Content Delivery Network (CDN). Experienced and demanding users will find a lot to explore. The clunky interface doesn't make any of this easy. Fortunately, a searchable web knowledgebase is ready to help. It's absolutely crammed with detailed guides and tutorials – searching for WordPress lists a total of 203 articles – and the results are well presented, with options to filter them by source (knowledgebase, forum etc) or category. Most of these are highly technical, but the service does a good job of sorting its search results, and we found the most basic and fundamental articles usually floated to the top. If all else fails, starter plans come with basic support which includes a community forum and ticket-based access to a support team. These are only available during working hours, five days a week, so you could be waiting a while for any response. In our experience the agents know what they're talking about, though, and they should be able to get most problems fixed quickly. Web hosting is basic and short on standard features, but experts will love Alibaba Cloud's huge range of enterprise-level products and technologies.